The dining room of the parents communicates with the hall-lounge by a sliding door. As in the adjoining room, a huge bay window overlooks the park. The choice of precious materials (pear tree, marble) and the sobriety of their implementation illustrates the refinement of the state rooms for which, as in the rest of the house, Mallet-Stevens designed all of the furniture and every tiny detail of the décor. 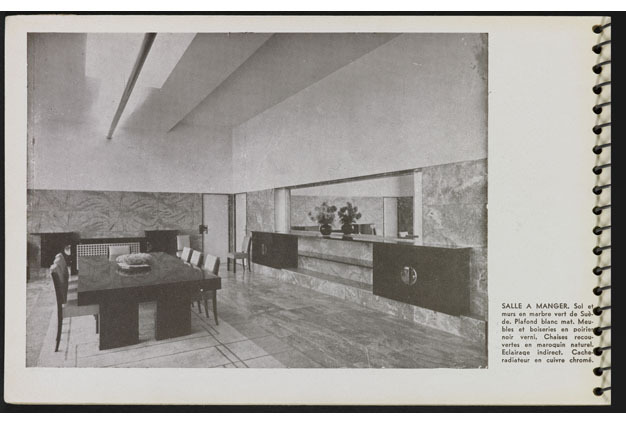 In it we can detect reminiscences of the Stoclet Palace, designed by Josef Hoffmann in 1905, whose luxury and solemnity had a strong impact on Mallet-Stevens. The beige colour of the walls harmonises with the Swedish marble that decorates them and echoes the shades of the park. 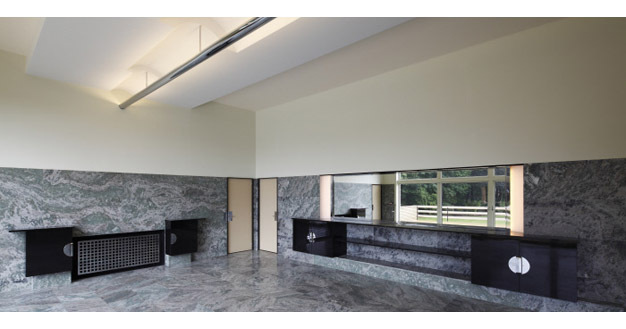 Other painting, traces of which were found only in certain rooms (the young man's room, for example) show the use of bright colours in the style of De Stijl. 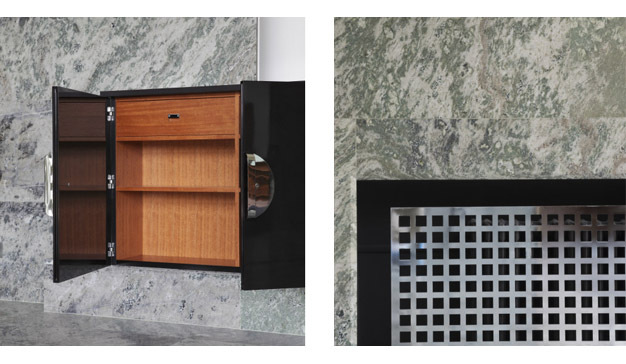 Mallet-Stevens refused ornament but gave much care to the choice of materials and their implementation. The floor and the lower part of the walls of the dining room are covered with Swedish marble cut in the bed, so as to reveal a "wave" pattern. During the restitution, particular attention was paid to the choice of plates and their installation to be as close as possible to how things were in 1932. The dining room furniture is blackened and varnished pear tree. Mallet-Stevens designed almost all the furniture of the house, only exceptionally calling upon his usual collaborators. The furniture is designed to suit the function and décor of each room: here the elegant and massive forms emphasise the solemnity of the room. For the lighting fixtures, Mallet-Stevens called upon André Salomon, lighting engineer, with whom he collaborated while working on designing shops. Together, they exploited the possibilities of built-in indirect lighting, which was completely innovative in domestic architecture. For the dining room, they designed a reflector in decorative plaster, under which was fixed a long rounded rail in polished aluminium. The volumes of the casing create rhythm so that the light itself becomes a material in its own right. The mirror, placed above the buffet, has a dual function: it enlarges the space while bringing nature into the room. Hence, all the guests, regardless of where they are seated, can see the park.